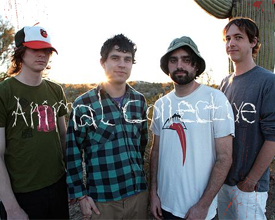 Who : Animal Collective from Baltimore, Maryland. What : From Strawberry Jam , the bands’ 7th studio album (Domino) comes Peacebone . Probably one of the more unusual songs you’ll here on the site, Geologist, Panda Bear, Avey Tare and Deakin have created something pretty damn original here. A little avant garde or chaotic (or nursery rhymy), we dig it. They hit the stage on sunday at 5:05pm .